We finally got some snow last week. Up until then we hadn't really had enough to be worth mentioning. It is a little hard to tell up here on the hill exactly how much we had because it blows around so much, but I guess it was about 20 inches. My biggest trouble when we have snow like that is keeping the lane down to the barn open. After I plow it for the first time the snow banks create a great place for the wind to dump more snow into. After the snow banks are 3 or 4 feet high the plow on thé truck can't throw the snow up over the bank. The obvious solution is to push the snow banks back with the front end loader tractor, but I had a little trouble there too. I don't often use the tractor in the winter so I never thought about putting anything in the fuel that would keep it from gelling, which is what diesel fuel wants to do when it gets cold enough. Anyway, I was able to get the thing started without much trouble, put the tire chains on (tractors are supprisingly helpless on snow ontop of frozen ground without chains), then promptly got it stuck. While I was digging it back out the wind was able to hit the fuel lines at just the right angle to gell the fuel and the thing quit running. 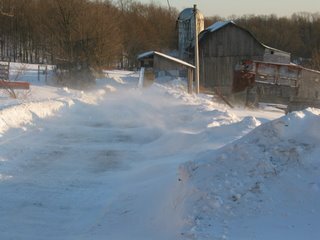 After a day with a heat lamp on the fuel tank and a jug of magic jelled fuel rescue potion I was able to get the tractor started and open up the lane again. Yesterday and today feel like Spring. Sunny and 40's. So I am sitting here in my coat. We heat our old farmhouse with a forced hot air oil fired furnace, supplemented by the Bengal Blue Jet cookstove that we have in the kitchen. Well the furnace started blowing fuses the day before yesterday, but it was infrequent enough to allow me to figure out what the problem was very quickly. It was only killing about 2 or 3 fuses a day, and the furnace comes on pretty frequently in the 10 degree high weather we have been having. Finally, yesterday afternoon at about 2:30 I determined that the motor that runs the blower was burning out. The replacement motor is about 45 minutes from here in Scranton. I had to wait for a kid to get off the bus at 3:30, but I figured if all the stars aligned that we could make it by 4:30 when the motor shop shuts its door for the night, but the stars didn't align. We got into the minivan, I turned the key and nothing happened. After a little investigation and a lot of help from Davey at NAPA I was able determine that the problem was that the key cylinder had given up the fight. So today we will be borrowing a car, going to Tunkhannock for a replacement key cylinder, then on to Scranton for a replacement blower motor, constellations willing. It is about 45 degrees in here, which is really pretty impressive when you think about it being 0 degrees over night and the only heat is the Bengal, which is in the kitchen, which is not central to the house. I was supposed to be cleaning up my workshop yesterday afternoon when I came across an old fan that I had with a burned out motor. This was a three bladed barn fan that my neighbor had given me, and it really moved a lot of air, but when it burned up I figured it wasn't worth the expense of fixing. Anyhow, when you are self employed and your boss is a pushover it is easy to get away with spending an afternoon in pursuit of a kakamame scheme. I have been wanting to build a little windmill for some time. I ended up welding an overhead garage door roller on the bottom of the motor and welding a stem on the back of the motor that could get a fin or rudder welded onto it. Then I bent a piece of pipe to the right shape and welded a plate to that so I could attach it to one of the rafters in the old Gut Hut (now the woodshed). Then I just mounted the windmill on the pipe by putting the spindle from the door roller into the end of the pipe. 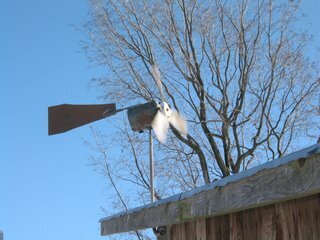 The roller turns to allow the windmill to always face the wind. 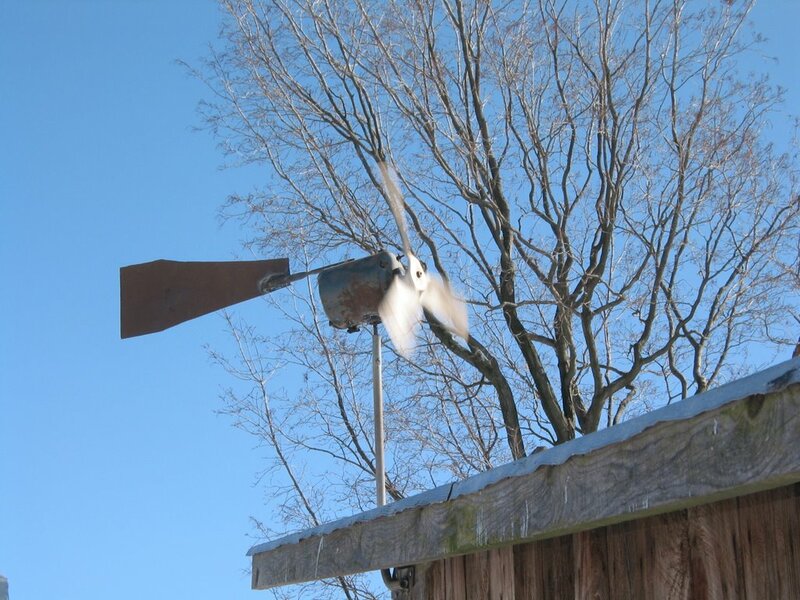 Ultimately this thing is just a fancy weathervane, but it is fun to watch. I would like to have a windmill that would generate some electricity, but I guess this is a good start. It is a little hard to tell from this picture but the blades are spinning so fast that they look like a solid wheel. 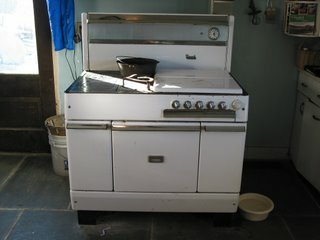 It also makes a whirling sound, which our dog Sheila barked at for quite some time last night. I like the sound it makes. It sounds like harnessed natural non polluting energy.